Cleveland Cavaliers forward LeBron James in a game against the Philadelphia 76ers at Wells Fargo Center. One night, the Sixers take the floor and vanquish a team with the league's best player, igniting talk that he could join them in free agency this summer. Another night, the Sixers relinquish more than one 20-point lead, and you're left speechless at how a team with so much talent could look so inept. That's just sort of how it goes when you're following a team as young as the Sixers are. Until Joel Embiid and Ben Simmons iron out some of the kinks, the Sixers are going to swing wildly across the spectrum of good and bad. Maybe that's why they're such an interesting team to write and talk about. If Philadelphia goes out and gets a max-level free agent this summer, the conversation and the stakes get a lot more real. For now, there are still philosophical debates to be had, questions to be asked about everyone from the players through the coaches and all the way up through ownership. With that in mind, it's time to check in with some writers around the internet and see what's on their mind when it comes to the Sixers. From one of the game's all-time greats to a backup guard who looked like he'd never make it, here are a few things to check out. Steve Nash, T.J. McConnell whisperer? How did T.J. McConnell transform from forgotten, undrafted player to an integral part of Philadelphia's bench? Hard work, a bit of luck, and an open opportunity would be where you'd start with his story, but recently it appears he is getting help from a guy who knows about making it work without elite athleticism. Nash found his younger self in McConnell. “He sees the pictures, he uses those spaces well,” he says. The massive contract signed by JJ Redick had several different purposes, with preserving future cap space at the top of the organization's list. By giving Redick enough money to not care about a lack of long-term security, they bought his loyalty, at least temporarily. From the sound of things, that loyalty might extend beyond this season. He seems content where he is at the moment, and told Pompey as much while on the road over the weekend. “This is something that I’ll reiterate that I said last summer when I signed here. I want this to be a long-term thing,” the shooting guard said Sunday morning. Redick is having a career year after signing a $23 million, one-year deal with the Sixers on July 8, 2017. The 33-year-old was averaging career bests in scoring (16.7 points), rebounds (2.5) and minutes played (31.6) heading into Sunday night’s game against the Milwaukee Bucks at the BMO Bradley Harris Center. His 3.2 assists were his second highest average over his 12-year career. And this summer, his team will have a lot of cap space available to go after A-list free agents. Redick could be deemed expendable, depending on which free agent the Sixers are able to lure. Will Sam Hinkie ever work in the NBA again? Not all of you care or want to think about the departed Sixers GM, and if that description suits you, you're free to move past this section and move on to the next one. But regardless of the debate over his basketball decision-making and handling of the franchise when he was here, I find Hinkie to be a fascinating, unique figure within the realm of pro sports. And while the public tends to paint him as some terribly complex man, Gonzo spends a lot of time highlighting the things that ground Hinkie and connect him to his peers. The common thread that connected the reflexive Hinkie stories was that of an aloof introvert who struggled to talk to the person in front of him. Agents and executives and reporters moaned about his supposed unavailability. Hardly anyone, Hinkie included, really bothered to knock that perception down. What's causing Robert Covington's extended shooting slump? Of all the players on Philadelphia's roster, I think the conversation is least sensible on Covington. He's never as bad as his darkest moments and not as great as his hottest streaks, but he's a good basketball player who doesn't need to be debated to the degree that he is. Mike did an excellent job reconciling the different components of Covington's second-half slump — you'd have to be a subscriber to read and watch all that is within — and ultimately concluded there is no singular cause to point to. It's somewhat shocking that the Sixers' offense has thrived through Covington's cold streak. Before the New Year, Covington hit 38 percent of the Sixers' made threes while on the floor. Since then, he's accounted for just 27.2 percent. And yet, the Sixers' offensive rating has improved from 104.1 to 108.3 during those stretches. It's bizarre that Covington has been part of the league's fifth-best five-man unit during that time despite his struggles. There has been an influx of LeBron stories swirling around the city over the last couple weeks, and I would take any rumors with a grain of salt. His camp is insanely guarded on big free agency decisions, and that will continue to be the case as a potential career-altering choice looms this summer. 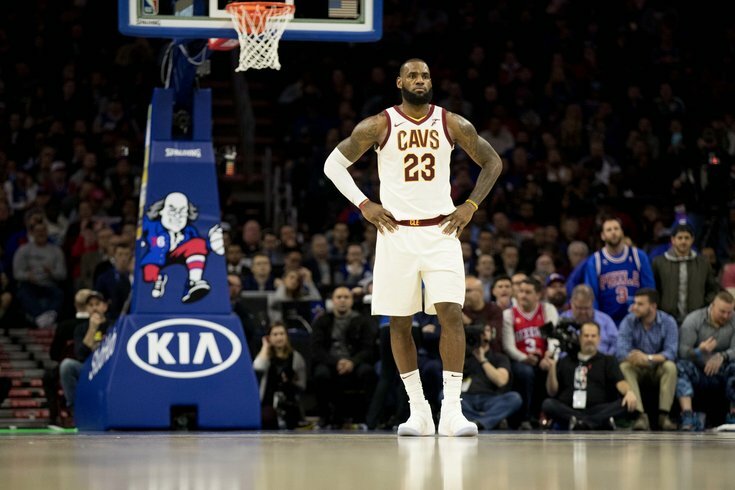 The rest of his will feel free to speculate, however, and Simmons (the writer) sees Simmons (the player) and Embiid as the best partners for LeBron's final stretch. In 2018, LeBron James signed with Philadelphia to build one last mini-dynasty with Embiid and Simmons. He vowed to play seven more years, until he turned 40, and vowed to make it his last stop. Just as important, he wanted to be closer to New York City and to his goal of becoming the first active billionaire athlete, with an eye on building his business empire and eventually owning an NBA franchise. Where art thou, Markelle Fultz? Philadelphia's need for Fultz's skill set is obvious, and it's something I've been personally harping on in this space for a while. Murphy made his case for how dire the situation is through the lens of Philadelphia's collapse against the Milwaukee Bucks. In Embiid and Simmons, the Sixers have a couple of players who can create the kind of matchup problems that Antetokounmpo does for the Bucks. But there is a reason Bryan Colangelo traded one of his most valuable assets to move up from No. 3 to No. 1 this past spring. With Fultz, they thought they were adding a dimension that did not yet exist on the roster. The whole thing was built with the presence of that skill set in mind. Let's be frank: on the list of people who matter in the decision to build an arena, an athlete who will only play there temporarily matters little to the powers that be. This is all about the suits in the boardroom and how much money they think they can milk out of it. Despite being built just over 20 years ago, the Wells Fargo Center really shows its age compared to more modern arenas around the country. For a player and a team used to practicing in a state-of-the-art facility over in Camden, it's not surprising they'd be interested in upgrading to a shiny new arena for home games. What complicates things in this arena upgrade is the Sixers being a tenant in their own building, a sore subject around the organization. Their contempt for being locked into a lease has never been hidden, with the comms staff going so far as to disown the "Wells Fargo" portion of the building name in official press releases. Rumors have swirled around the Sixers trying to build their own basketball-only arena ever since the new owners took over earlier this decade. Regardless of what happens with the arena upgrade or a new project outside of it, I have but one stance: taxpayers should not be asked to pick up a single dime of that tab.